Beyond Fear Magic Shines, an inspiring name for an inspiring project. A partnership between iriscent and Marie Le Chevallier in order to create magic. 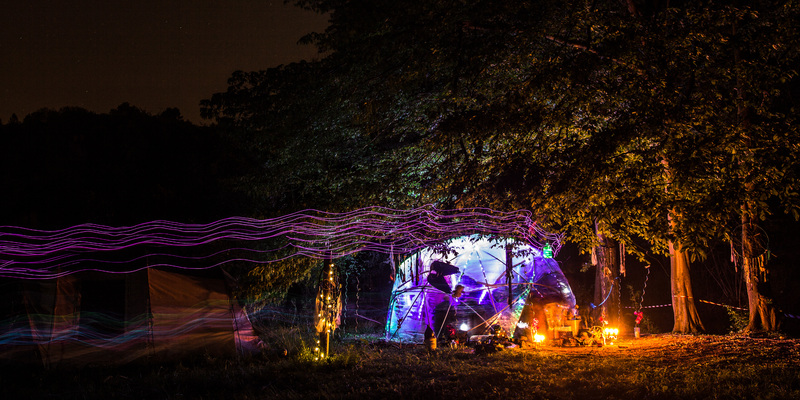 This scenographic project was imagined and conceived by Marie and took place at the Creme Brulee Weekend, a co-creating event impulsed by the Frenchburners, which is a non-profit association representing the Burning Man Community in France. Beyond Fears Magic Shines is the expression of a transformative and healing process in which we all are. Going far beyond your own fears to reach and discover or rediscover magic. This magic that lay down inside us, that we sometimes forget. We then need to dig deep to feel again the cocoon of love that defines each and every one of us. The goal of this workshop is to use the 6 senses (vision, audition, touch, smell and intuition) to create a unique dreamy, sensorial and transcendental experience that interacts with both your Garden of Fears and your Inner Cocoon. A bubble dome was settled into the forest to create the cocoon. Nature helped emphasize the Garden of Fears. Experimental music and unusual sounds were used as well as shamanic objects, black wings or crows. An olfactive experience was also designed inside and outside the dome around the themes of Fear and Innerself.